EDIT: I’m giving away a $50.00 shopping spree to AllModern.com to kick off this challenge! Enter here! Join me in the Pattern Challenge!!! -Make your goal(s) attainable and realistic for your personal life. -Not interested in sewing clothes for yourself? That’s OK! Make your goal to sew clothes for your children, or your husband, anything goes! -Blog about your goals, or if you don’t have a blog, get it in writing. You’re more likely to challenge yourself if you have someone to keep you accountable. 3. Grab the “Pattern Challenge” button and Join our Flickr group. -Post on your blog’s sidebar to get the word out! Post about this on Facebook! Tell your friends! –Send me an email if you are participating, and I will add a link to your blog to my sidebar of participants. 4. 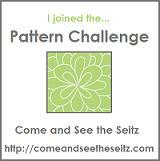 Blog about your finished garments and categorize/tag them as “Pattern Challenge” . In addition to this, you can post them to our Flickr group. Be sure to add a note to your picture with a link to the blog post that describes the garment, if there is one. -Title your blog post according to the sewing pattern name, and include “Pattern Challenge.” For example, my first pattern was Burda 7550, so I’ve titled my first post, “Pattern Challenge: Burda 7550.” This will help when others are searching for pattern reviews. -How awesome would it be if someday we had a whole pattern library from these posts? My mind is spinning! Please, feel free to offer suggestions! My vision for this project is that in just a short amount of time we will have a virtual pattern library full of our reviews and photos of finished garments. We will also stretch ourselves to learn more about garment construction and we will have a way to share in the joys (and sometimes terrors!) of sewing clothes! Please consider joining with me if you have any inkling of a desire to sew more clothes! Great idea, Sarah! I might join the fun after I finish my quilts. Hi Sarah – thanks for your email. I’ll just have to check with the calendar and see if I might join and let my readers know about it – it’s a great idea! 🙂 I’ll get back to you on this! I’m so up for this! I’m totally in, my challenge is to sew one garment a month. Sounds like a great plan and I already do projects like this on my blog anyway. I’ll kick it up a notch and try something really technical for myself — maybe a pair of pants! This is a great idea! I’m looking forward to making some summer dresses! I’m in too! Simplicity 2725. Thanks! This is great. I have many patterns I need to make for summer. I am having a problem getting the badge though. I have a wordpress blog but can’t seem to make it work with your badge. Do I use the text widget? Hey! Yes, I used the Text widget and I updated the code on the “Join Me” page, so hopefully that will work now! I will also email it to you. I was linked here from another blog – I’m definitely joining soon! I should have plenty of free time coming up and goodness do I have enough patterns! I am very new to sewing but excited to get some goals set and some experience …. Love this idea! I’ll definitely join in! I’ve just found your blog and found this challenge and I would love to join in! Is it too late??!!!! And is there a time limit to complete the challenge?! I want to join. I can’t get your button to work on my blog. Ok, I’m slow to tell you this, but I’m joining the challenge! YAY.. I am SO in..
am experiencing problems with your RSS. I don’t know why I cannot join it.